PennsylvAsia: University of Pittsburgh's Eastern Asian Calligraphy Club to meet on Wednesdays. 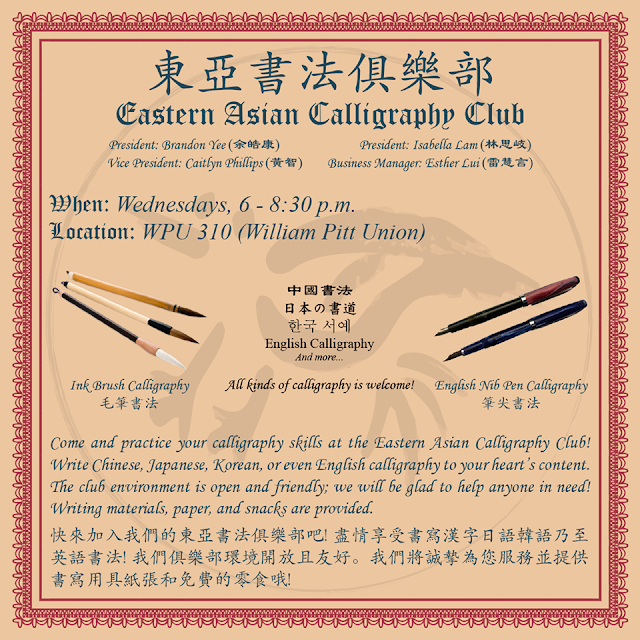 University of Pittsburgh's Eastern Asian Calligraphy Club to meet on Wednesdays. The University of Pittsburgh's Eastern Asian Calligraphy Club will resume meetings on Wednesdays from 6:00 to 8:30 pm in the William Pitt Union. Come and practice your calligraphy skills at the Eastern Asian Calligraphy Club! Write Chinese, Japanese, Korean, or even English calligraphy to your heart's content. The club environment is open and friendly; we will be glad to help anyone in need! Writing materials, paper, and snacks are provided.